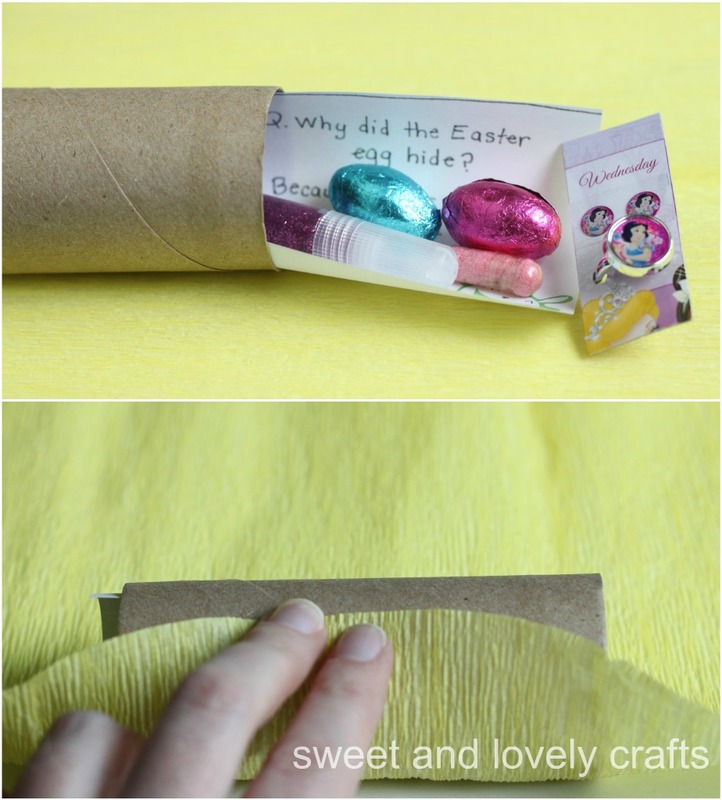 Everyone loves these crackers at Christmas time, so I thought that it would be nice to have some for the kids to do this Easter. It would look nice to have one at each place setting with Easter dinner. They didn't take very long to put together either. I just picked up a few things that I thought the kids would like in their crackers. Claire's obsessed with glitter glue, which means Simon loves it too. If you're making these with small kids (under the age of three) it's probably not a good idea to add the sponges that grow in water. I was supervising the kids with these, and they loved watching them grow. It's not a cracker unless it's got a joke in it. So be sure to check out the ones that I used at Happy Home Fairy. 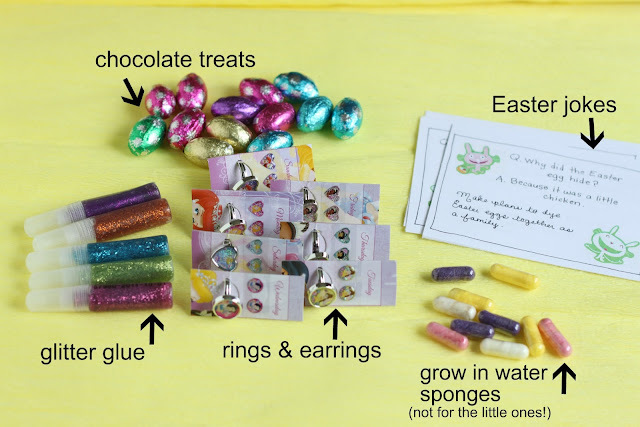 I included a few chocolate eggs in each one as well. They're so simple to make. Pick up one of each item, lay them on top of the joke, and then slide them into the toilet roll. Cut a sheet crepe paper to be about 12x17 inches. 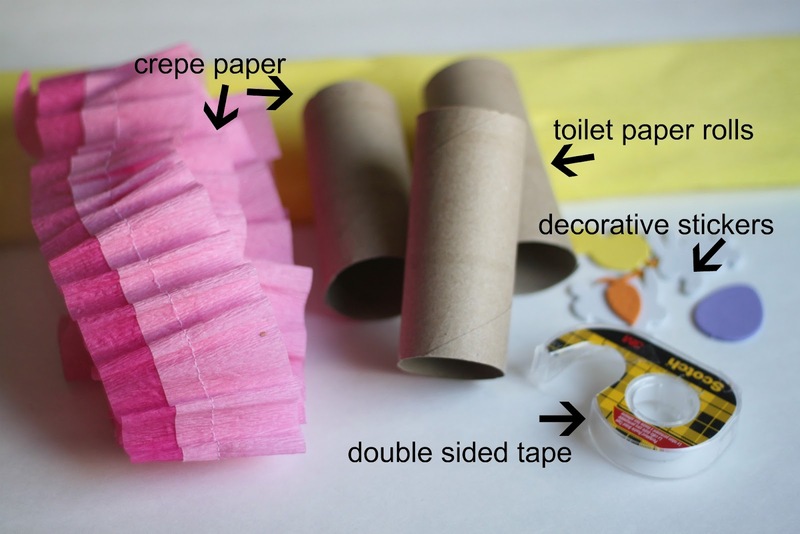 Roll the toilet roll up in the crepe paper, and place a piece of double sided tape to keep the crepe paper in place at the end. Then twist the ends of the roll. I embellished mine with leftover ruffled streamers from Claire's birthday, but they didn't really have the ruffled look that I was hoping for. To keep them ruffled, made them too loose, so I ended up pulling them tight. The moral of this is, don't worry about using ruffled streamers. You could just layer streamers, or use a piece of patterned paper. I added a foam sticker and that's it! These really would make a delightful addition to any Easter meal. what a sweet idea!! love them Pinning!!! 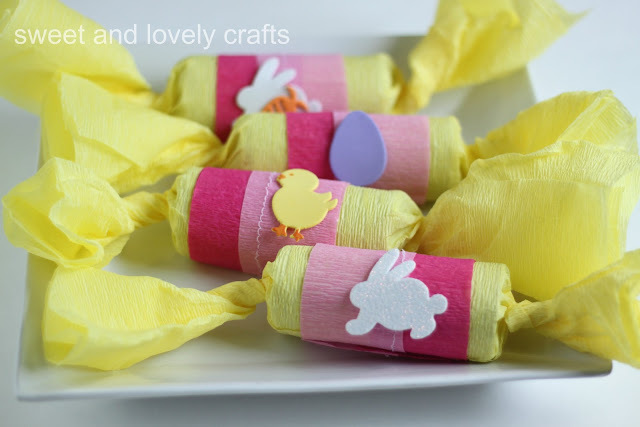 What a cute idea to make Easter crackers!!!!! So super cool! Like Christmas Crackers. My daughter and I did something like this for her birthday party favors. The weird thing was it didn't take me as long as I expected to save up all the rolls. These are adorable! 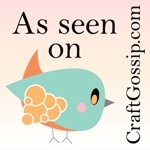 I love cute ideas like this! Would you consider sharing over at my party? Darling! I just made some of these recently, too! I may need to track down some of that wide crepe paper. I used regular streamers for mine and then wrapped them in party napkins. I don't know why I am just now seeing this!!! I LOOOVE that those Easter jokes are in those cute crackers!!! What fun! Made my day! Even if it is a whole year later. :-) Happy Easter 2013!